Need to forward mail to your new home? You need to change your address before you move so that your mail is sent to your new home by the time you move in. You can change your address online for free with the U.S. Post Office. However, this change won’t last forever, and there’s no service that will change your address with everyone that matters in your life. Fortunately, in today’s online world, you can get your address updated with everyone during a single lunch break. Submitting an official change of address to the post office is kind of like the safety net of address changes. Ideally, everyone who is sending you mail will have your new address. However, if someone slips through the cracks, the post office will forward your mail to your new address for up to a year. You can go to the post office in person to change your address. 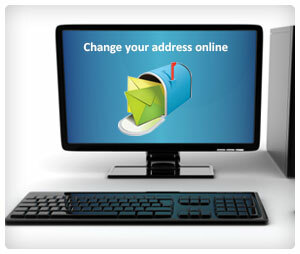 You can also change an address online by filling out a change of address form. Be sure to submit it at least two weeks before moving to allow for processing time. Note that magazines, newspapers, and other periodicals will only be forwarded for 60 days, so update your subscriptions as soon as possible. This list isn’t comprehensive. Take a couple of minutes to think of everyone that either sends you mail or delivers you products through the mail system just to make sure you won’t be missing anything in a year. Skipping this step might seem smart (“Traffic ticket? What traffic ticket?”), but resist the temptation. The onus is on you to notify the DMV of your new address, and if you don’t, you suffer the consequences. Beyond tickets, if your state’s vehicle agency doesn’t have your current address, then you could miss out on receiving renewal forms for your driver’s license and car registration. And without those forms, you might have to (cue scary music) go to the DMV. Most states’ DMV allow you to fill out and submit a change of address form online (look for forms on your state agency’s website, which you can find here), or, at worst, print out the form and mail it in. Phew. There’s no special change of address form for voter registration. You just have to fill out a registration form like any new voter. Go to the post office, library, or county elections office to fill out a form if you like doing things the old-fashioned way, or visit www.eac.gov and click “Resources for Voters” to find your state’s online registration form.